Outdoor modular lounges are enjoying extraordinary popularity at the moment as we look to bring the comforts of the lounge room into the great outdoors. There are many options available these days in a variety of colours, sizes and most importantly quality. It is not always easy to tell the difference so we have put together this guide on what makes our premium Maldives Synthetic Rattan Furniture collection so special. So what is Sunbrella? You can read about it in more detail here but essentially it is a high performance textile that is highly resistant to UV, mildew and stains. In practical terms it means it won’t fade if left in direct sunlight and it is super easy to clean. Many times a wet cloth will do but if you get a significant stain on it like a red wine spill you can clean it with a bleach mix. Yes bleach. That is because the colour is not dyed onto blank fabric as with so many others but the thread itself is coloured to the core. Outdoor lounge buying tip: If your lounge is going to be in any direct sunlight be sure to go for a light coloured cushion if it is not made with Sunbrella. That way the fading, which may well occur very quickly especially on some low grade polyesters will not be as obvious. Sure these cushion covers are removable but the beauty of the Sunbrella fabric is you can easily and effectively clean the cushion covers while they are still on. For instance bird droppings can easily be removed with just a little soapy water and a brush and in many case just a wet cloth will do the job. However. should you want to remove them the cushions are sealed with a YKK zip for easy access. Outdoor lounge buying tip: – If you are checking a wicker product out in store try sticking your fingers through the weave. You can soon feel the difference. Quality synthetic wickers won’t easily part, this is a simple test to show if the quality is good. Underneath all that wicker is a frame, an essential element to the structure of the piece. There are a few points to note here. Firstly the fact that it is aluminium means that it will not rust and therefore degrade the structure which could potentially stain your surface. It also means it is lightweight making the pieces fairly mobile allowing for easy cleaning or changing around your seating design. Secondly, the fact the framing is welded means the integrity of the lounge will be maintained after years of use. A steel bolt-together frame would of course be cheaper but will not provide the benefits of welded aluminium. Buying tip: Check with the outlet that the lounge is not “KD”. This is industry speak for knock- down. It is a very efficient way of shipping and therefore cheaper but it means there are parts that have to be bolted together. Quality outdoor wicker furniture pieces will generally not be KD. We have researched a variety of cushion constructions over the years and in the Maldives setting we see a beautiful balance between comfort and longevity. It is necessary to use a somewhat firm foam to ensure that it doesn’t collapse in time. Our high quality medium density foam does indeed provide comfort and support but to further enhance that plush feeling this foam is sandwiched between soft layers of fibrefill. The result is a super comfy pillowtop cushion that will hold its form. Quality cushions are not only essential in maintaining the comfort of the lounge but also the look of the lounge. Inferior cushions will flatten out and lose the filled-out look quite quickly. Sunbrella is a highly water resistant fabric but if the cushions are left in the rain, moisture will eventually penetrate the fabric which is completely normal. To ensure that any water does drain out as quickly as possible every base cushion is finished with a layer of textaline on the underside. This is an all weather PVC mesh that allows water to freely drain through it and also helps the cushions to breath. Drying time is also accelerated so you can enjoy your lounge sooner after it has been wet. Not only do the matching coloured glass tops on the accessory tables look great but they are also a much better performance option. Many tables will have a fully woven wicker top with clear glass sitting over it. The problem with this is that the clear glass works as a magnifier making the sun that much more damaging to the wicker sitting underneath it. Outdoor table buying tip: Always look for tinted or coloured glass if your setting will be exposed direct sunlight. Sunbrella back up their fabric with a 5 year warranty and Royalle have matched that on the frame and Solaris wicker. That’s FIVE years on the fabric, FIVE years on the frame and FIVE years on the wicker. That’s actually three years more than what others call an “extended warranty” and even charge more for it. Five years at no extra cost. 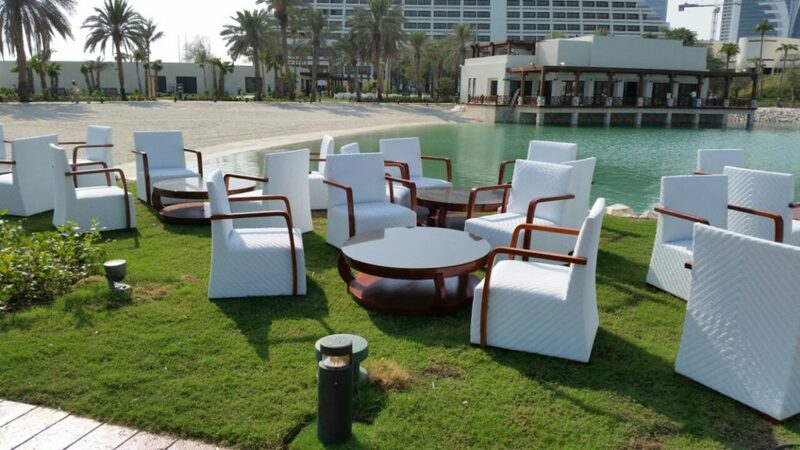 These modular outdoor lounges are a great option when it comes to tailoring an outdoor lounge setting to your space. With a variety of individual seating options and accessory tables available there is no limit to the number of combinations you can put together. Here are just a few of the possibilities. 2016-17 Update: Given the popularity of the Maldives collection we have added another colourway option. “Elk” is a lighter coloured Solaris grade 5 wicker. Like the Moonscape wicker used on the Maldives collection it has a half round profile providing it more strength and substance.